UPromise recently (as far as I know) introduced a new program called eCoupon that allows participants to save money when shopping at local grocery stops and, at the same time, get college savings. If you don’t have a UPromise account, get one. Register your grocery shopping cards at UPromise, which will link them to your UPromise accounts. Every month, UPromise provides different coupons for items you usually shop, such as tissues, bottled water, snacks, detergents, etc. 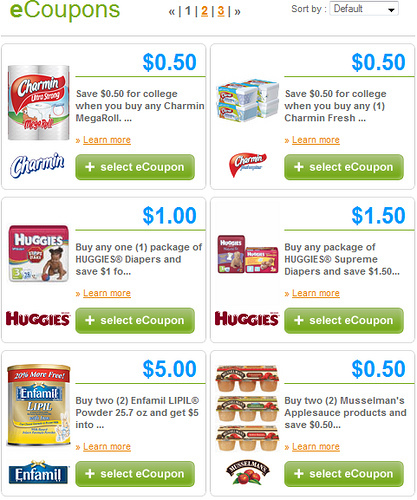 Select the items you want to buy and add them to your active coupon list. Go shopping and enjoy the savings. Yes, that’s it. Unlike other online coupon programs, you don’t have to print or clip anything with UPromise’ eCoupons. Because your grocery shopping cards are already linked to your UPromise account, the only thing you need to bring when you shop is your grocery cards. When you check out the items, the savings from eCoupons will be applied and rewards from the purchases (not the coupon values) will be added to your UPromise accounts as college savings. Quite easy, right? Do you want to use it?